Please pardon the long absence! Life has been crazy for the past couple of months. But, hopefully I will be back on target and updating my blog much more often. I wanted to share a great program with you from the makers of Filemaker Pro. 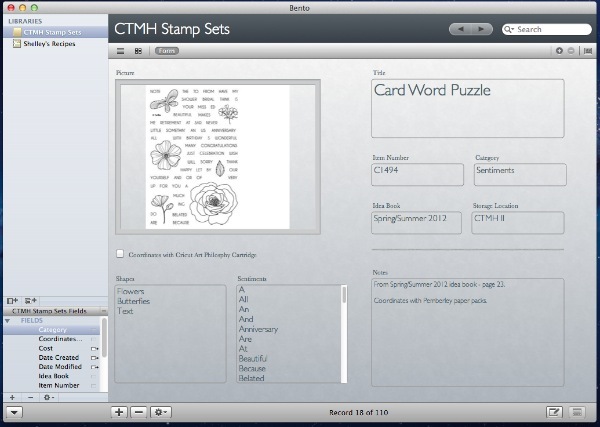 This is “Bento 4” – a great, easy, user-friendly database software for Mac. I downloaded it from the App store on my computer for the sale price of $29.99 (it is usually $49.99). It is going to be great for storing databases of my crafting supplies, books, recipes, you name it! 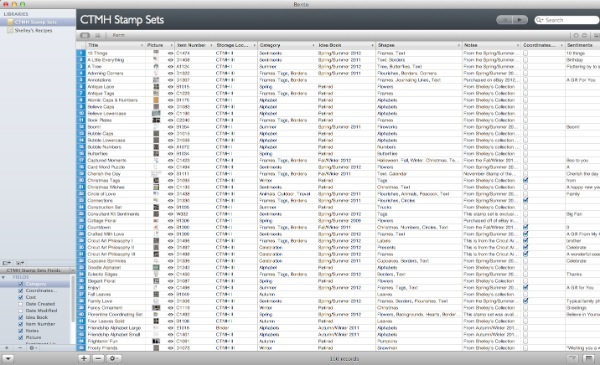 Below is the inventory form that I am using to organize and itemize my Close To My Heart My Acrylix stamps. This way I can see what each of the stamps looks like and tag it according to what is on it. Since Bento searches the text that I save on each form, I can easily find a stamp for “Happy Birthday” or “Thank You” or any shape that I tag for the stamp set. This particular stamp set – Card Word Puzzle – has a ton of sentiments on it along with some beautiful shapes. You can see the way that I have tagged it. The list view is also a great, easy way to make edits to the data in your forms. You can easily see a large number of entries and edit them as needed. I have had so much fun organizing with Bento. I now have all 110 of my My Acrylix stamp sets inventoried. You should definitely check it out – especially while it is on sale! I liked you video about bento 4 . I was wondering how or where do you get your pic’s of your stamps . And I have a windows dell computer can I use it with that. As well my n I-pad . Thanks for you time . Love your video. Just wondering, can you print your inventory? Where did you get your template? Could you share it? Glad you enjoyed the video! To print the entire inventory (rather than the single page) in Bento go to File > Print > Table/Form > Show Details > Bento (this is in the 4th pull down menu from the top) > Choose “Print: All Displayed Records”. > Click “Print”. This was actually kindof tricky! It took me a few minutes to figure it out, actually. I made the template myself from scratch and I will add it to this blog post as an update. Hopefully these will work for you.